Ashton Gerard/MDN Prairie Sky Breads master baker Travis Gerjets visits with members of the community Saturday during their pop-up event at Classic Rock Coffee in Minot. Breads and baked goods homemade with love, what more could you ask for? Taking things another step further, Prairie Sky Breads will now be available at Classic Rock Coffee in Minot in addition to their bread subscription service. Classic Rock, located at 1408 2nd Avenue SW, is the exclusive retail location for Prairie Sky Breads. Saturday was Prairie Sky’s first day at Classic Rock and it completely blew master baker Travis Gerjets away. Through the trials and tribulations of opening their own bakery, it was encouraging for Prairie Sky Breads to see the community rally around them at their pop-up event. Classic Rock Coffee in Minot is becoming the exclusive retail location for Prairie Sky Breads. 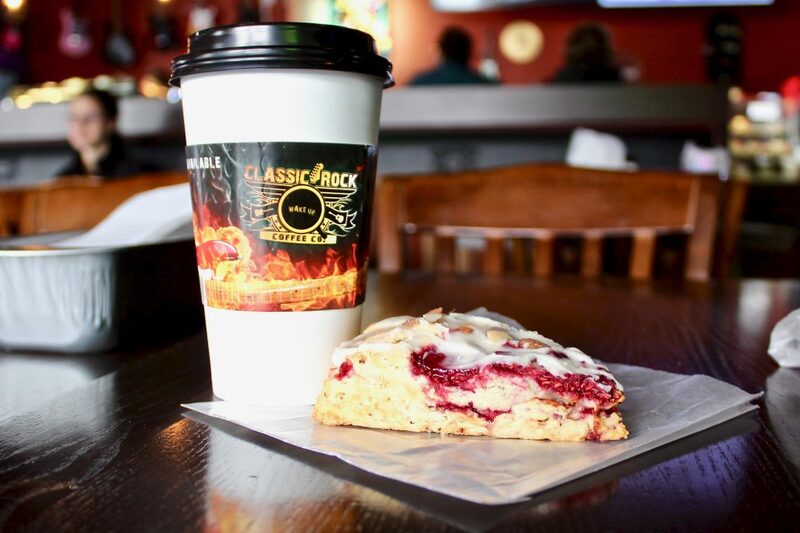 Pictured is a Prairie Sky raspberry almond scone paired with Classic Rock’s “Sweet Emotion” specialty coffee. Gerjets learned how to bake from his grandmother and when he moved to Minot from Minnesota in 2014, he decided to contribute some bread to his friend’s farmers market stand to add more interest. As someone new to the community, Gerjets began bonding with the people of Minot through their bread stories. With Gerjets’ passion for bread, he was able to build connections with people and found a way to immerse himself into Minot’s community. Since Gerjets came onto the farmers market scene back in 2014, Prairie Sky Breads has taken small steps to establish itself into what it is today. 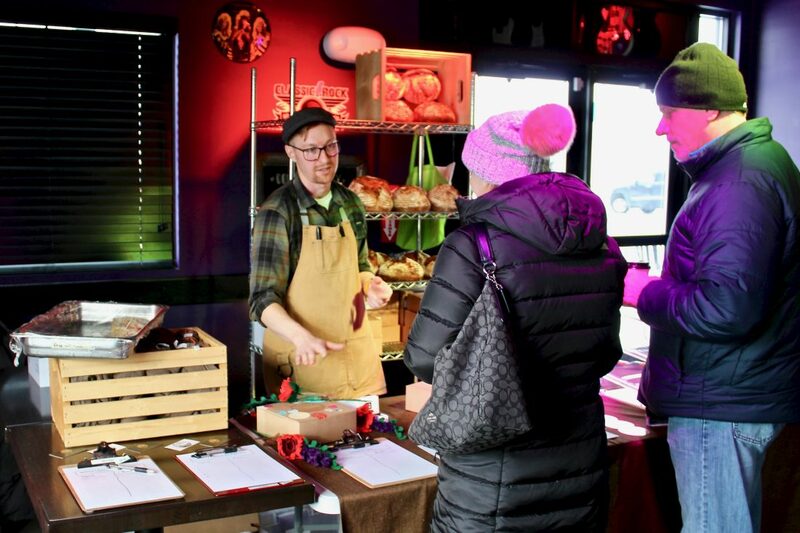 Obviously, farmers markets in North Dakota run for a limited time during the year thanks to the snow and cold, but Gerjets found a way to overcome this hurdle and provide bread to residents without their own retail space yet. For their bread subscription service, people can sign up for a “season” which can last anywhere from one to three months where, after paying for the subscription up front, they will receive a fresh-baked loaf of bread every single week delivered to their home or workplace. This falls under a community supported bakery model where people pay up front for all the loaves of bread and because of the big, dedicated purchase, Prairie Sky is able to sell the bread at a discount and makes managing their budget, baking schedule and payroll easier. They also offer baking classes. 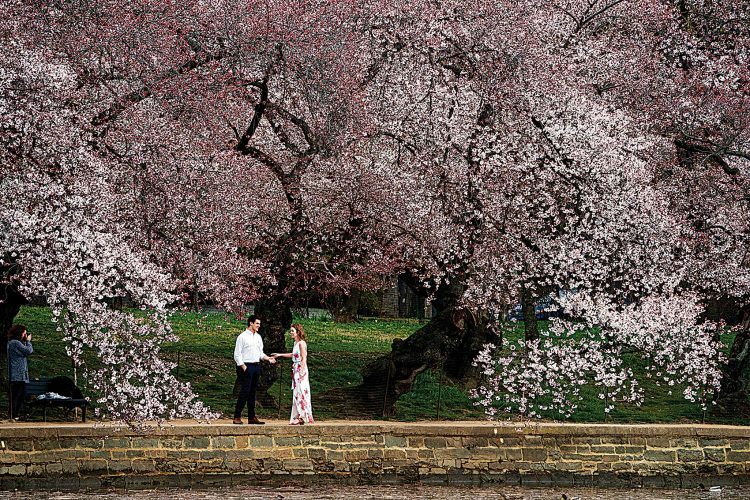 which offers a chance to gather once or twice a month and look at some different specifics in baking such as artisan breads, scones, dinner rolls and more. Mostly, Prairie Sky breads hosts classes at the Parker Center but is also in partnership with The Foundry off of Broadway in Minot to host classes there from time to time. Their next class at The Foundry, located at 1407 South Broadway in Suite C, will be held Wednesday, Feb. 13, for Valentines Day. Participants will be learning how to make Strawberry and Dark Chocolate Scones while enjoying a night of conversation and special Valentines Day beverages. For more details, visit prairieskybreads.com. Now, with their partnership with Classic Rock Coffee, Prairie Sky Breads is just growing their accessibility to the community while they work to open up their own retail space. Gradually, Prairie Sky will be bringing more products to Classic Rock. This week, Classic Rock will feature some of Prairie Sky’s Valentines Boxes and scones offered individually as well. The Valentines Day boxes feature their strawberry and dark chocolate scones and local coffee packaged in a limited edition box designed by Minot’s Daniel and Alyssa Sharbono of 62 Doors Gallery & Studios and will also come with a felted flower from Jazmine Wolff Schultz of Cold Front Crochet in Minot. To stay up to date on all things Prairie Sky Breads and Classic Rock Coffee, visit them on facebook at Prairie Sky Breads Minot and Classic Rock Coffee Minot ND.